Recent advances in genomic and omics analysis have triggered a revolution affecting nearly every field of medicine, including reproductive medicine, obstetrics, gynecology, andrology, and infertility treatment. Reproductomics: The –Omics Revolution and Its Impact on Human Reproductive Medicine demonstrates how various omics technologies are already aiding fertility specialists and clinicians in characterizing patients, counseling couples towards pregnancy success, informing embryo selection, and supporting many other positive outcomes. A diverse range of chapters from international experts examine the complex relationship between genomics, transcriptomics, proteomics, and metabolomics and their role in human reproduction, identifying molecular factors of clinical significance. 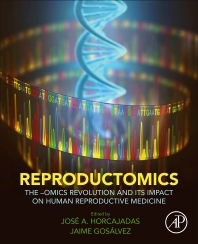 With this book Editors Jaime Gosálvez and José A. Horcajadas have provided researchers and clinicians with a strong foundation for a new era of personalized reproductive medicine. 1. Is the classic spermiogram still informative? How did it develop and where is it going? Jose Horcajadas, PhD, is Associate Professor at the University Pablo de Olavide, Sevilla, Spain. Dr. Horcajadas is an expert in translational research with emphasis on human implantation. He has more than 50 publications in high-impact peer reviewed journals including The Journal of Endocrinology and Metabolism. For the past 3 years Dr. Horcajadas has been an active collaborator in the development of a three-dimensional endometrial culture system at The Jones Institute, which has resulted in several significant publications and presentations. Dr. Horcajadas has also presented at various national and international meetings. Professor Jaime Gosalvez is a permanent member of the Department of Genetics at the Universidad Autonoma of Madrid in Spain. He received his Ph.D. in Biology with specialization in Genetics in 1979. He teaches courses on Molecular Cytogenetics, Models and Evolutive Processes and Advanced Technologies for Biology. His research interests are in the areas of molecular cytogenetics with special emphasis on DNA structure and function. He is deeply involved in the analysis of different aspects of the DNA molecule in the sperm and their possible implications in male infertility, with special emphasis in human, other mammalian species and fish, as well as those clinical aspects of the male factor to achieve pregnancy. Dr. Gosálvez has published more than 250 original articles and 190 abstracts have been presented in different national and international meetings. He has published 15 book chapters in the area of cytogenetics and sperm quality assessment and has edited two books. He has been the Principal Investigator of more than 30 national and international competitive research applications, and he is co-author of two patents with world-wide protection.